Jersey team manager Brian Bisson has spoken of his excitement ahead of the World Bowls Championships in Adelaide, Australia. 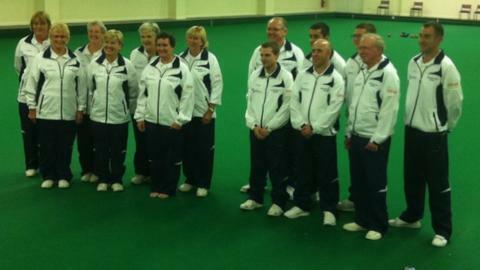 Five men and five women from the island have been named in the squad to compete in singles, pairs, triples and fours. "It's the top of the tree as far as bowls is concerned," said men's manager Bisson. "I'm particularly excited this time because we've got a young team and potentially a very good team." Women: Karina Bisson, Chris Grimes, Doreen Moon, Joan Renouf and Sue Dingle. Men: Malcolm de Sousa, Greg Davies, Thomas Greechan, Lee Nixon and Jamie MacDonald. The squad includes Jersey sports person of the year and Thomas Greechan. "If they play to their potential I think we're going to do very, very well," added Bisson. "Last time we were there we finished 10th out of 32 countries, which for an island of this size is pretty good. "With the potential in this team we could finish higher and if we got anywhere near the top five I'd be delighted." Jersey's women's team includes Karina Bisson, the island's flag-bearer at the Commonwealth Games in Delhi in 2010. Women's manager Eileen Vowden is also hopeful her players can fire Jersey towards the top of the leaderboard in Adelaide. "I think we've got a very strong team, a great experienced team," she told BBC Radio Jersey. "Doreen is the least experienced player but totally dedicated. The other girls have been to World Bowls, Atlantic Rim and some have been to the Commonwealth Games." The World Championships run from 24 November to 9 December at Lockleys Bowling Club and Holdfast Bay Bowls & Croquet Club.